On behalf of Lorna and Wade Randlett, you are invited to a Friday June 26th lunch with Sacramento Mayor Kevin Johnson. Since taking office, Kevin Johnson has worked aggressively to reform education, including passing resolutions and supporting policies to empower parents to turn around failing schools and to ensure effective teachers are in every classroom. We applaud Kevin for his efforts to make Sacramento more green and our cities more sustainable. He facilitated Sacramento’s selection as one of the first five cities in the US included in President Obama’s Better Buildings Challenge to improve energy efficiency in commercial buildings. Thanks to Kevin, it was also one of just two cities to get chosen by the US Green Building Council to receive green retrofits for public school buildings. He also launched the Greenwise Joint Venture and ten-year Greenwise Action Plan to create 14,000 green jobs by 2020 and transition 2,400 homeless to permanent housing. Please join us for a fun lunch in support of the talented and hardworking Mayor of Sacramento Kevin Johnson (and not to mention NBA and Cal Basketball legend)! Since taking office, Mayor Johnson has embarked on an ambitious plan to reshape how city governments serves the citizens of Sacramento. His top priorities include improving public safety, creating jobs and economic development, launching green and sustainability initiatives. reforming public education, promoting good government and enhancing the quality of life for all Sacramentans. Before taking office, Mayor Johnson led a diverse career as a professional athlete, entrepreneur, and nonprofit executive. He served as CEO of St. HOPE and played professional basketball in the National Basketball Association – earning honors as a three-time All-Star. Mayor Johnson currently serves as President of the US Conference of Mayors, Chair of US Secretary of Education Arne Duncan’s Mayors Advisory Council, Chair of the National Resilient Communities for America Campaign, and member of the White House Task Force on Climate Preparedness and Resilience. 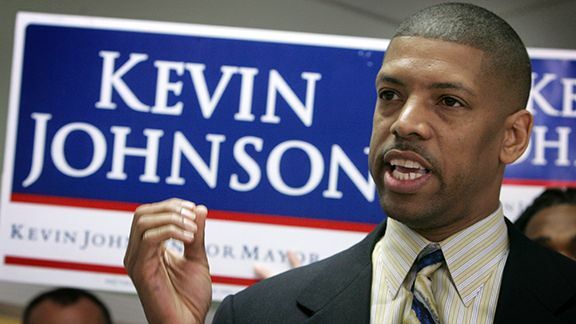 Be the first to comment on "Kevin Johnson : Lunch With The Mayor Of Sacramento"